The above phrase is not meant to offend anyone. It is taken from the Dummies series of books which claim to explain apparently difficult and complicated subjects in a straightforward way. The shahadah - la-ilaaha-illallah of course is profound, powerful, magnificent and multi-faceted. But at the same time it is extremely simple and is meant to be understood by anyone - even a child or a person of no education or culture whatsoever. The great secret behind this lies in one thing - the fitrah or the man's natural disposition to the shahadah. This applies to everyone from a tribal man in the jungles of Amazon to a professor of science or philosophy at the Cambridge or Oxford Universities. The Prophet Muhammad (PBUH) said: "every child is born on fitrah". Unfortunately we totally neglect this fact and come up with varied schemes to explain the shahadah to people. We go so far as to borrow concepts from philosophers and theologians of other religions, including pagan Greeks, and incorporate them in our discourse of the shahadah. One such example is the common use of the cosmological argument, ontological argument and the teleological argument for "proving" the existence of God. There are Muslim organisations worldwide who have based their "da'wah" on these arguments. They have overlooked the fact that these arguments are full of defects as has been pointed out by both Muslim and Non-Muslim scholars throughout the ages. In addition to that not many can understand them! The Prophets and Messengers have a different approach to explaining the shahadah. Their way is the fitrah-way (or the "shahadah for dummies" way!) which anyone can learn and confidently apply in all situations. It is ironic that not many Muslims are aware of this empowering concept. 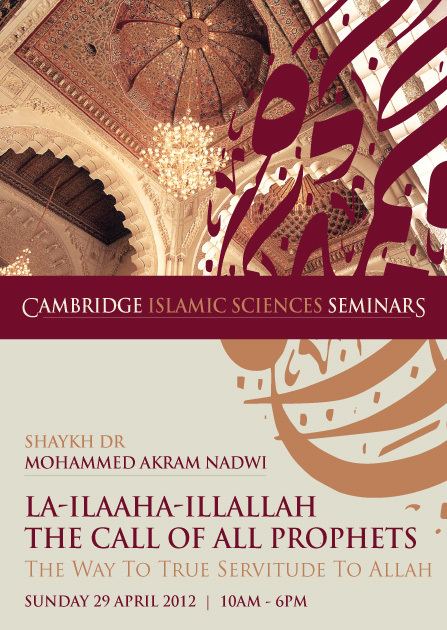 Therefore a significant part of the Shahadah Seminar on Sunday by Shaykh Dr Mohammed Akram Nadwi will be dealing with this including dismissing those foreign philosophical concepts. This is not only helpful for da'wah but for one's own understanding and development. And of course this seminar also deals with many other aspects of the shahadah in a way that has not been dealt with before in the English language. This is your last chance to register for this life-changing seminar. Please register now.